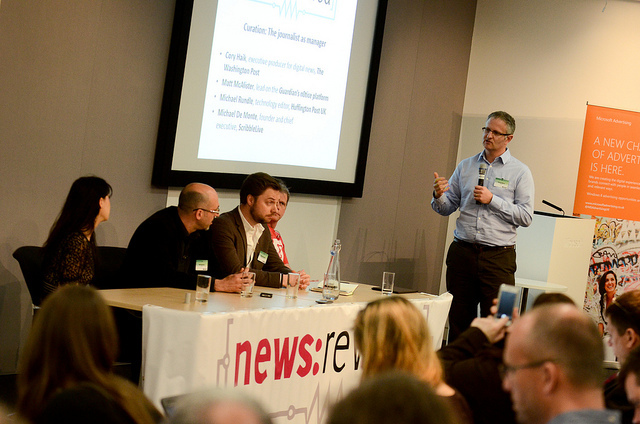 The opening joint session at Journalism.co.uk’s digital journalism conference news:rewired looked at the role of journalists as curators of the content both on their own news outlet’s platforms and the wider web. It was moderated by Darren Waters, head of devices and social, MSN UK. The session offered plenty of inspiration and advice on the different ways journalists and news outlets can curate content from across the web, whether within standard articles, on the homepage, through a liveblogs or through special multimedia projects which work with social media to present a window into the discussion taking place around an event. Below is a video of the session, filmed by James Goldburn and Jeremy Evans.